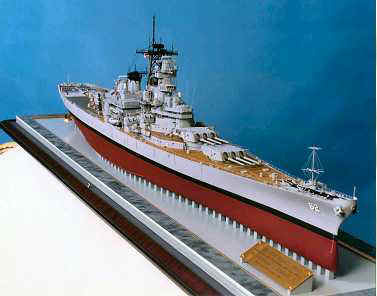 This museum-quality model is currently on display aboard the USS New Jersey at Camden, NJ. Finally brought home to her “name” state in 1999, the battleship is now enshrined as a museum; a memorial and tribute to those who have served in her in war and peace. 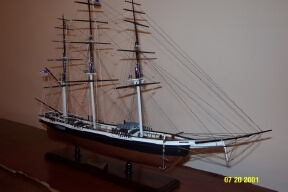 It is the second model of this ship built by Nick. However, this is a static display model as compared to the radio-controlled model he built that is shown elsewhere in the gallery. 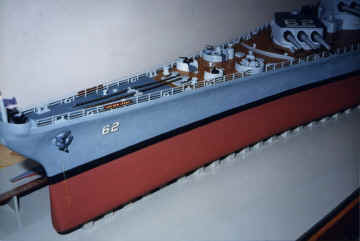 This model also differs in that it depicts the vessel in 1985 as compared to the other model which depicts her as she appeared between WW II and the Korean War. 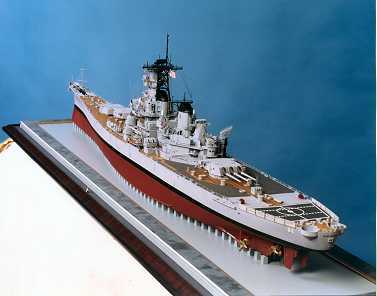 Scratchbuilt to plans by Alan B. Chesley, et. al. 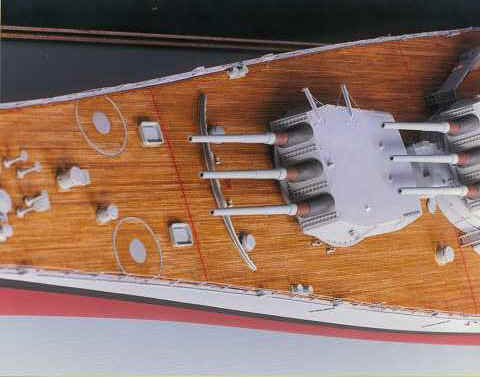 Wood decks consist of 1850 hand laid pieces of “teak” planks simulated by red gum strips. Construction materials - basswood, styrene, red gum strips, copper sheet, resin, fiberglass and brass. Photo-etched railings, radar screens, ladders, gratings and frames for helo pad nets. Use of dry transfer decals throughout. 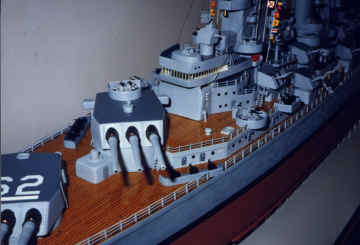 Extensive use of resin casting for such components as gun turrets, directors, 20 mm Phalanx guns, 16” gun barrels, Tomahawk launchers, Harpoon cruise missiles, windlasses and deck apertures. Commercially purchased cordage, blocks, anchors chocks, bitts, chain, fire hose/hydrants, life rings, doors and winches. Floquil solvent and acrylic paints and teak stain applied throughout. 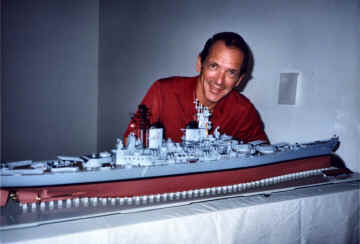 THIS MODEL WAS BUILT BY Nicholas' son, NICKY, WHEN HE WAS 15 YEARS OLD. 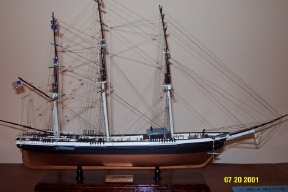 IT IS A GENERIC CLIPPER SHIP NAMED "SEA WITCH" HAVING AN LOA OF 21". 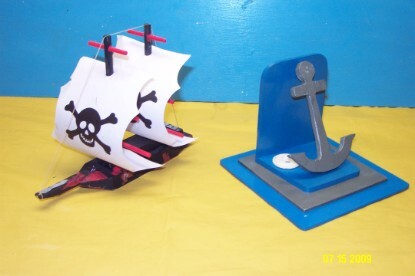 THE CRAFTSMANSHIP IS QUITE REMARKABLE ESPECIALLY WHEN YOU CONSIDER HIS AGE. THE MODEL STANDS AS A REMINDER OF HIM, HIS SPIRIT, AND HOW MUCH HE HAD TO OFFER BEFORE HE WAS TAKEN FROM US. 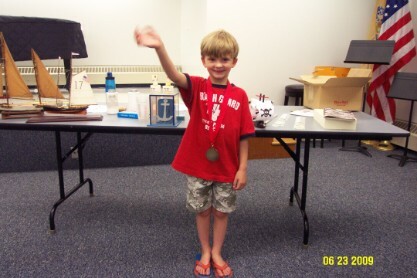 Grandson Nicky at age 6 standing in front of two of his models. Sailboat and Nicky's latest creation a mounted hand-crafted anchor.